The lieutenant governor might look like he's playing in a race when he's not. And a Washington political organization that's not supposed to mess with Democrats might just be messing with a Democrat. Appearances notwithstanding, Lt. Gov. Dan Patrick does not have a favorite, publicly speaking, in the hot Republican primary raging right now in Senate District 31, a sprawling piece of Texas that connects the Panhandle and the Permian Basin. It looks like he does, though, which has fed the suspicion — and the narrative — that the Senate’s presiding officer has it in for the Republican incumbent in SD-31. One of Patrick’s top guns, Houston political consultant Allen Blakemore, is applying his considerable skills to the campaign of Victor Leal, a restaurateur and former mayor of Muleshoe. Leal is not the incumbent. He’s one of two Republican primary challengers to Kel Seliger, a former mayor of Amarillo, who is seeking re-election. Challenger No. 2 is Mike Canon, a former mayor of Midland. This kind of turf talk happens all the time. Blakemore’s presence in a race outside of Houston, in particular, is commonplace: He’s been doing Republican campaigns all over the place for decades and has built a reputation and a client base and he has prospered. This isn’t about that. Of course, Patrick would be well within his rights to try to knock the stuffing out of an incumbent senator from his own political party, if he thought he could trade up. He does it, too. Just ask Sen. Craig Estes, R-Wichita Falls, who’s trying to fend off a challenge from state Rep. Pat Fallon, R-Frisco. Fallon has Patrick’s full endorsement and has enjoyed the help of another Patrick consultant, Bob Wickers, along the way. Decide which situation you would prefer if you were challenging a legislative incumbent in the GOP primary: The endorsement of one of the state’s leading conservatives, or the professional assistance of one or more of the people who helped that endorser get elected in the first place. If what Seliger says falls well short of a wedding announcement, it’s better than Estes got. Patrick is not opposed to the return of Kel Seliger to the Texas Senate. 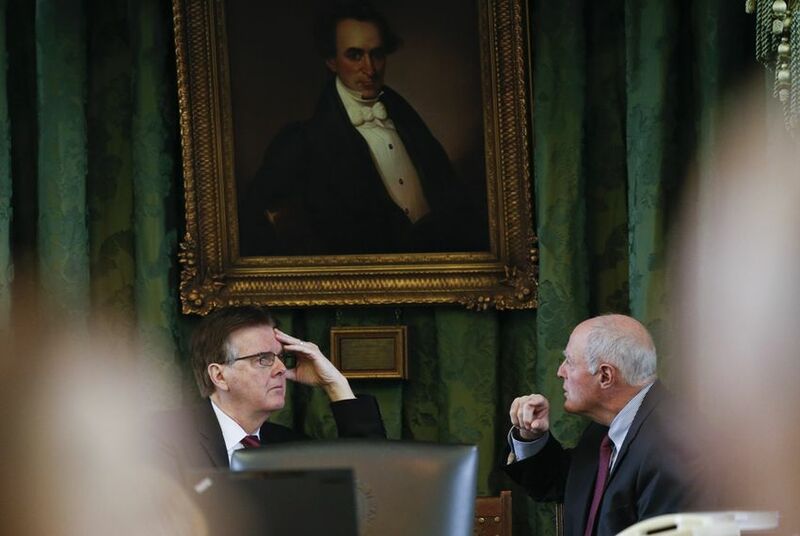 He’s not for Seliger, exactly, but in spite of the fact that his longtime hired gun is working against the senator, the lieutenant governor’s thumb is not on the scale. That’s not the only behind-the-curtain drama this political season. On the Democratic side, there’s a head-scratcher that is bringing more attention to a congressional candidate than she was getting before the controversy erupted. Laura Moser, one of seven Democrats vying for a general election shot at U.S. Rep. John Culberson, R-Houston, now has an extra and most-unexpected opponent: the Democratic Congressional Campaign Committee. The DCCC is bringing attention to the kind of information usually passed around by opponents in unsigned manila envelopes, saying Moser is a Washington insider who only recently moved back to Houston and who is spending campaign money on her husband’s political consulting firm. They even fished out a quote from a 2014 Moser article in which she said she’d rather have a tooth pulled without anesthesia than move to Paris, Texas. The political people in Washington believe, apparently, that that was a swipe at the whole state. Maybe, but Houston ain’t Paris. And you know this one: Politics ain’t beanbag.